True, the nearest big cities are over three hours away. But there's plenty to do right here. 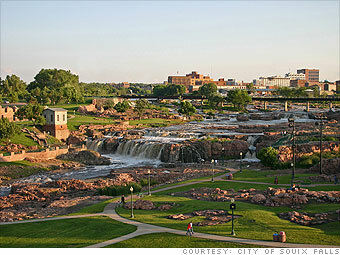 Sioux Falls boasts numerous arts galleries, theatres, museums, restaurants, and nightlife. The park system is extensive, with biking trails, sports fields, and the popular Great Plains Zoo. This town has weathered the economic storm better than most, with many employment opportunities and affordable homes. Health-care facilities here also get high marks. --B.D. Is Sioux Falls a great town, or what? (2) Median based on fewer than 50 home sales in the area.